The Cultural Landscape of Sintra encompasses a narrow mountainous strip with an ensemble of gardens, parks, and monuments. The Royal Court established itself here because of its cool temperatures. Villa’s and gardens were designed, reaching its height in the 19th century. Eleven years later I did the same trip. From Lisbon, by train. Walking up the winding road that leads to the town. Because of the misty and rainy weather I took a bus further up, to the Palacio de Pena. This is (on the outside) really a magnificent fairytale palace. My trip to Sinta was blessed with triumphs and (unavoidable?) pitfalls. I planned early based on reviews in our community that a day trip was not enough. Moreover, staying one night and using a rental car allowed me to see a pleasant mix of what Sintra offers. Granted, there was plenty I did not see. Weather was not great, overcast, and spotty showers were always a threat. Tourism numbers at some key sites were reminiscent of China. Considering, I arrived early on Thursday and left late morning on Friday, I was not quite prepared for this. In fact, I would describe my driving as absolutely courageous and I will always be proud that my rental did not suffer a scratch. Pena Palace was over-the-top, a bit over-rated and yet still charming. I certainly enjoyed exploring this tapestry of color, but was left wondering how this assemblage of vanity and endearing madness became a world heritage site? If Hearst Castle ever wishes international recognition from UNESCO, they surely have a precedent! The romantic in me was smitten, the Historian was dumbfounded in the resources expended in such a endeavor that served only the wild dreams of royalty. Admittedly, this can be said of royalty throughout the world, from China to Portugal and beyond. Castle of the Moors was a pleasant hike, which provided great views of Sintra and the National Palace. There is not so much on display here, but the fortress does feel part of the landscape. 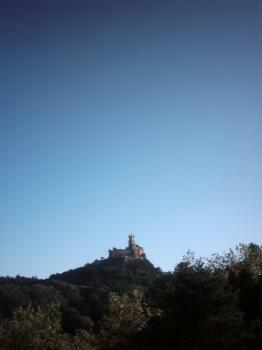 In fact, the "castle" reminded me of mountain fortresses that can be found throughout Korea. Sintra National Palace was indeed quite spectacular in several of its interior chambers. The tourist numbers in the National Palace compared to Pena Palace are nothing short of astonishing. The later, was all but empty as my wife and I had large expansive rooms all to ourselves. Pena Palace on the other hand, required long queues to just enter any room of moderate interest. I was able to visit the exterior of Quinta da Regaleira and that alone is stunning and strange enough. Though, I do regret I did not have the time to visit this fascinating site properly. The Cultural Landscape of Sintra is often viewed as the most outstanding world heritage site in Portugal. I cannot disagree, but while I enjoyed my visit, it was not my favorite. Sintra was the first WHS on my trip to Portugal in May 2018. Actually, palaces and gardens are not my favourite kind of WHS, but due to the positive reviews and the high rating on this website I expected an enjoyable visit. Thus, I scheduled two days for Sintra to visit all the major sites. And I was not disappointed. I arrived at Sintra at noon and went first to the Palacio nacional de Sintra in the town centre, its history dates back to the Middle Ages. The first what I saw were the iconic conical chimneys of the palace kitchen, a nice prelude. And also the interior was a pleasant surprise. 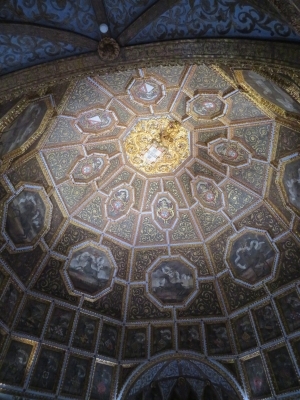 I liked best the wooden ceilings painted with magpies and swans, and the Room of Coats-and-Arms with its blue and white azulejos. Well, these tiles are ubiquitous in Portugal, magnificent, but after a while you get used to them and the wow-effect is weakening. Next I headed to Quinta da Regaleira, just a few minute walk from the centre. The Manuelistic palace was interesting to visit, but the highlight was the wonderful magical garden. It was great fun to explore all these grottoes and lakes and fountains - most spectacular were the initiation wells, a kind of 'underground towers' lined with spiral staircases. Quinta da Regaleira is one of the most popular sites in Sintra and thus quite crowded. But in summer, it is open until 8 pm and in the late afternoon after the daytours have left, you can really enjoy the garden. 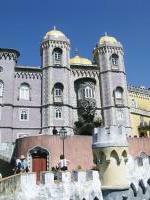 The program for the next day was Pena Palace and Park and the Moorish Castle. The Palacio Nacional da Pena opens at 9.30, so I had plenty of time to walk from my hotel to the park entrance. I had already bought a combined ticket the day before, so I was the first in the queue (but be aware that there is a second queue at the entrance of the palace). A short walk up to the palace and for a few minutes I had the scenery for myself. 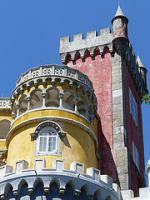 The Pena Palace is an exuberant and quirky mix of styles, an explosion of colours and shapes. Modesty and reserve look different. The royal family used the palace as a summer residence until 1910, after the proclamation of the republic it was opened to the public. The entire interior has been preserved as if the family was still living there. That's what makes the visit so interesting. The Parque de Pena is huge, not as magical as at Regalaira, but still worth exploring: fountains, bridges, small temples and a rich vegetation with endemic and exotic plants. Hard to believe that there was only barren rock before it was built. 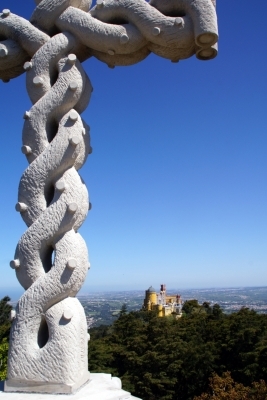 In the park is also the highest point of the Sintra Mountains, Cruz Alta, popular because of the fantastic view of the palace (photo with the summit cross). You have also a nice view from the St Catherine's height, a few steps below. In the west of the park is the pretty Chalet da Condessa d'Edla, built in the style of an Alpine chalet, the interior design is different in each room, an eclectic mix of different colors, shapes, patterns, materials. At the outside, cork is the main element of decoration: window and door frames, the balustrades and railings are decorated with cork. Opposite to the Pena Palace is the Castelo dos Mouros or rather its ruins. As the name suggests, the castle was built by the Moors, and later reconquered by the Portuguese. Today, the huge walls meander around two mountain peaks of the Sintra Mountains and offer great views of Sintra and the surrounding countryside. For the way back to Sintra I took the hiking trail around the Castelo and via the Villa Sassetti. The villa is currently under renovation and is due to be opened to the public soon. You can take a hop-on-hop-off bus between these sites, but I chose the sportive way and walked all the distances. So I spent a whole day in the Sintra mountains. The next morning I visited two sites on the western part of the inscribed area: Palacio de Monserrate and Convento dos Capuchos, both less frequently visited than the palaces in Sintra. Both are easily accessible by bus, but I went there by car because I wanted to continue my trip in the afternoon to my next destination, to Mafra. There were only a few other visitors in Monserrate early in the morning. The palace in its present appearance dates from the mid-19th century. The building basically consists of a long gallery that connects the three towers. 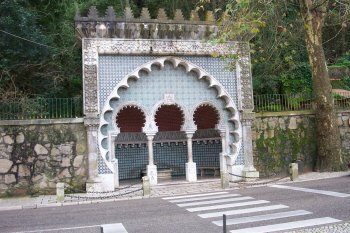 The eclectic style is similar to other buildings at Sintra, but the Moorish influence is clearly visible: the arches and pillars of the gallery and the decoration of the domes. The palace is surrounded by a large landscaped garden but I took only a short walk around the palace and through the Mexican garden. And finally, the Convento dos Capuchos, a former Friars convent, in the middle of a forest. After passing the hidden entrance, you go up through narrow corridors and plain rooms, all lined with cork to insulate from cold and humidity. You end up at a small central place with a fountain and a chapel, surrounded by high trees, a lovely and enchanting place. I spent one full and two half days in Sintra, and that was a good decision. Of course, there are similarities between the palaces and gardens, but each site has its own characteristics and its own specific charm. But if you have less time I would suggest to visit Pena Palace, Quinta da Regaleira and Sintra Palace. As I mentioned at the beginning, I am actually not very keen on visiting palaces and gardens, but there are an increasing number of exceptions: Potsdam, Wartburg, Fontainebleau, Versailles (the gardens), Alhambra - and now Sintra. Seems that I have to reconsider my assessment, obviously I like to visit palaces, at least the best among them. I decided to do a one day trip to Sintra from Lisbon. I think this is the minimum amount of time you should spend there. In retrospect, I wish I had done two days there - either staying overnight in Sintra town or catching the train back again from Lisbon. It's a beautiful landscape with so much to see. I found it fascinating to see the evolution of the site from the period of the Moors, through the Medieval years, up to the Romantic 19th century and even into the way Sintra is used today. There is no doubt in my mind that this is one of (if not the number one) best WHS in Portugal. So it's no surprise that it is incredibly busy. The other advantage of going for a second day is that you can visit some of the areas that are less crowded because the day-trippers focus on the highlights. Having said that, if you want to see the highlights, I would suggest seeing the National Palace, then Quinta da Regaleira, then the Moorish Castle and then Pena Palace. That gives you a real variety of what's on offer and shows the different historical periods. 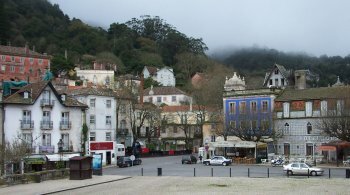 I absolutely loved my visit to the town of Sintra in the mountains outside Lisbon, Portugal. Sure, the weather was grey and brisk, and my warm layers were packed away in my lost luggage, but the day I spent there in the fall of 2012 was so memorable I would gladly return even under the same circumstances. 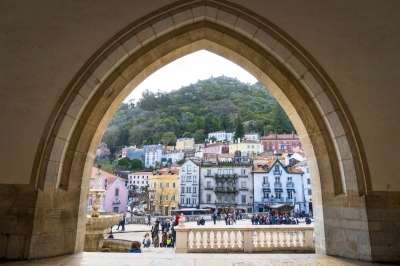 Sintra's brightly colored town center is surrounded by castles -- the Royal Palace downtown, the Castle of the Moors on a nearby mountaintop, and the magnificent Pena National Palace, on another peak. Of those castles, I only had time to visit the Arabesque-Manueline hybrid that is Pena Palace; it was an amazing tour, with incredible views of the town, gardens, and surrounding cultural landscape from atop the towers and walls. The only other site I visited, was the unforgettable estate Quinta de Regaleira, designed by Carvalho Monteiro, a 19th century Portuguese millionaire. Monteiro was very interested in Freemasonry and the Knights Templar, and he incorporated their symbology throughout the house and gardens. As fascinating as the house was, I was thrilled to explore the gardens, which were replete with secret tunnels, grottoes, fountains, and spiraling wells. Sintra was marvelous, and reason enough for me to return to Portugal some day. Logistics: Sintra is an easy train ride from central Lisbon, and there are several buses that operate on circuits connecting the train station to the castles and the town center. Buses are also available from Sintra to Cabo de Roca, the westernmost point of continental Europe. Sintra is the classic destination for a daytrip from Lisbon, and I did spend a full day there, but it would be quite easy and tempting to take it slowly and dedicate 2 or more days to the area. There is definitely plenty to see to keep you occupied for quite some time. The site is a cultural landscape consisting of the centre of the town of Sintra plus several palaces in the surrounding mountains that were the favourite retreat for Portuguese royalty and nobility for many centuries. There are various types of buses available, and I chose a hop-on hop-off day pass for just 5 EUR that makes the rounds to all major sights (they arrive reasonably on time, but are often stuck in the massive traffic jams). The first stop after the station is the town centre where the National Palace is located. This medieval royal residence is quite an interesting building famous for its conic chimneys and wooden ceilings with beautiful decorations. 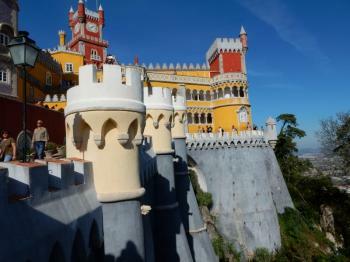 After that, I took the bus up the winding mountain roads to Sintra's true highlight - the Pena Palace. Thi is really a fantastic sight, looking like a movie set or Disney attraction. As mentioned below, both Gaudi and Disney seem to have been inspired by its unique architecture and multi-coloured buildings. It is really a joy to walk around the site (still quite a long walk uphill from the bus stop) and enjoy the panoramic views over the mountains. Back in Sintra, I finished my day with a visit to the Quinta da Regaleira, a romantic palace with a large park full of features such as grottoes, lakes, and fountains that can take quite a long time to explore. Sintra is always full of tourists and, even though it is not very far from Lisbon, it is probably a better choice to stay there for a night or two to better experience a really unique site. I visited this WHS in August 2014. Knowing that this WHS was actually made up of 4 palaces, a castle and an estate, I decided to dedicate 2 full days to Sintra and sleep over. It turned out to be a great decision. Sintra is choc-a-bloc with cars, coaches, vans and bus loads of tourists mainly from 11am till 4pm as most visit Sintra as a day trip from Lisbon. If it's the only way to see Sintra by all means go for it but still I'd suggest to stick to no more than 3 sites. Having more time to spare, I arrived by car from Lisbon around 9am and there were ample parking spaces to choose from. The parking meter lets you pay a maximum of 2 euros for 4 hours but by registering your number plate online (there are instructions on the parking meter) you can simply pay online or send an sms to extend your parking time. I bought the combined ticket to visit Pena Palace + Moorish Castle + Monserrate and then bought a separate ticket to visit Quinta in the evening. The Seteais Palace is a luxury hotel which I proudly called my home for a night. The Ramalhão Palace is decorated in the Louis XVI neoclassical style and I only saw it from outside. 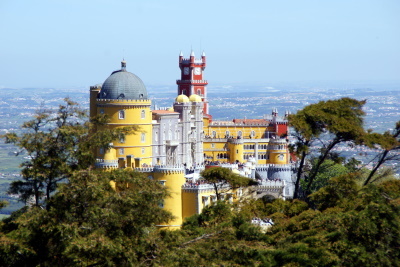 The Pena Palace is the star attraction of Sintra and hence is the palace that attracts most crowds. Visiting early in the morning meant that I managed to beat the crowds so by the time I finished viewing it's colourful exterior and visiting its interior, endless groups of people flooded the palace! Therefore I'd say that timing is of the essence here. The Castle of the Moors is close to the Pena Palace so naturally attracts a lot of people too. At least however it offers more open spaces than the Pena Palace so it doesn't feel so crowded. It's worthwhile climbing the stairs to enjoy the view over Sintra too. My favourite palace is actually situated 4km away from Sintra but I really loved its exterior and interior design with Moghul-inspired details and the lavish gardens. I was very lucky to be the very first visitor early in the morning which meant that for a while I had the palace to myself and I really enjoyed some peaceful and quiet moments. The highlight of my visit though was the mysterious and esoteric Quinta da Regaleira. The Manueline style is immediately visible once you approach the estate and also on the small but enchanting chapel. The gardens are a labyrinth of tunnels, grottoes, statues and fountains full of esoteric symbols. I've never seen anything like the Quinta and I must say it's truly unique. It opens until 8pm in the summer months and occasionally there are private night tours or theatrical events organised on the estate grounds which I wholeheartedly recommend. All in all I enjoyed my visit to Sintra but I'm sure my experience would not have been the same had I visited only as a day trip from Lisbon. Reaching Sintra from Lisbon by train is easy, and reaching Penha Hill from Sintra Station by bus (#434) is just as simple. Then after paying the entrance fee, there is yet another conveyance that takes you to the palace at the very top. I think Walt Disney must have modelled his castle at Disneyland on this building, the difference being that this is made of real stone. But the pastel colours of the decorations rival those of Gaudi. Being at such an altitude the 360 degree views from the palace of the coast and surrounds are amazing. Descending towards the town it is easy to divert to the Moorish castle and admire the views from there too. Having visited the Penha Palace first I found the Royal Palace in the town rather bland. Sintra has many descriptions. 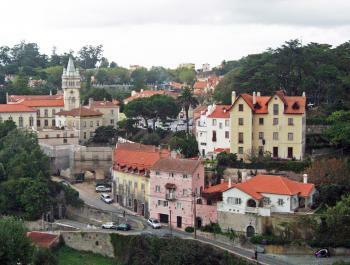 Dora Wordsworth said, "Sintra is a place more to dream than to write about". Robert Southley wrote that Sintra, "that vast temple to Nature" is like a "glorious Éden" (Lord Byron). 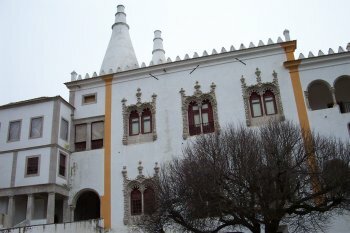 Wiliam Becford, who had a villa in Sintra, wrote that it was "the most blessed place in the whole globe". Gil Vicente, a famous portuguese playwright, wrote that "Sintra is a piece of heaven that king Solomon sent has a gift to a king of Portugal". Ptolemy refers to Sintra has "mons lunae" (Mount of the Moon). Sintra has been home for many artist over the centuries, like Luis de Camões, Garcia Resende, Damião de Góis, Almeida Garret, Hans Christian Andersen, Alexandre Herculano, Camilo Castelo Branco, Eça de Queirós, Ernesto Biester, Jan Van Eick, Carlos I of Bragança, Fernando II of Saxe-Coburgo Gotha and Bragança, Ludwig von Eschwege, Nicolau de Chanterenne, Wenceslau Cifka, Elisa Frederica Henler (countess of Edla), Alfredo Keil, Luisa Sigêa, Franz Lizt, Richard Strauss... From the mystical Pena Palace you can observe and apreciate the beuty and charm of this place. Down in the town be fascinated by the churches, the villas, the typical streets and cafe's, the museums and gardens, and, of course, the ancient Palácio da Vila, were you can remark,by looking up, the magical Castle of the Moors. If you want two examples of marvellous villas, Regaleira and Monserrate are certainty the best examples of it. As a American of Portuguese and French descent, my mother came here from the Azores islands in 1964, at the age of 23, and dad is from French Canada, and has been in the U.S. for 75 years! My heart belongs to Portugal, a amazing country, with a long and beautiful history. It makes me so happy to read the reviews. I have visited many countries in Europe, all were beautiful, yet Portugal remains unique. I long to see Lisbon from the castelo de sao Jorge at sunset. Or the spectacular view of Sintra from the palacio de Pena. Mafra and it's incredible convent/palace, that dome! You can see it for miles, I can go on and on, trust me, you'll love it. Sintra is one of the most interesting places in the world, for it history, and archeologie. It all begins same thousand years ago. You can have references about it, since the "Itenerários" from Plínio , Strabos, Pompónio Mela or iven from Strabão. But in my opinion the best historical references about Sintra you can read them in the "Monarchia Lusitana" from Frei Bernardo de Brito. There is also a very interesting book from João de Barros called the "Crónica do Imperador Clarimundo" the subject is Sintra but told in a very different kind of literature,(a midle - age way). Sintra during many centuries was known as "Monte da Lua", Moon Mount, where the most ancient culture manifestation take place. A heritage imortalized by Knight´s and Poets, it is a wonder that everyone should at least ones in life came and visit it. I just hope that in the future organizations as UNESCO can help to preserve this unique place in the world. The best time to visit Sintra is in the week and early in the morning to avoid the crowds. Take your time and walk around to admire the sights. You must visit the national Palace also known as Paço Real or Palácio da Vila. It was built on a site once occupied by the Moors. It is connected to the most significant period of Portuguese history, namely the birth and fall of the empire. Don't forget to visit the kitchens. I remember sitting on the balcony of Café de Paris at lunch time watching the tourists admiring this wonderful place. Sintra,village where I inhabit , is doubtlessly one of the most beautiful places in the world.I born and i grew up in this village that as much teaches, not only to its inhabitants as well to the visitors.it's the most occidental village in Europe, and has gorgeous beaches, that they are considered one of most beautiful of the world.Sintra offers almost everything: from palaces and mansions to densely wooded slopes and romantic or exotic parks and gardens; from churches and monuments to excellent restaurants.sintra possesss a very proper environment and spirit , attracts visitors of all species, inclusively has the myth of the accomplishment of satanic rituals.sintra has everything, with such can be made everything,and who lives here never will leave. Sintra was perhaps the highlight of my time in Portugal and that is saying a lot as I loved it there, and I didn't even get to see the highlight of the Pena Palace as it was closed. Sintra is very easy to get to from the centre of Lisbon there is a direct train from Rossio station and it takes about 35 minutes on a brand spanking new train! The centre of the town is next to the station and is reasonably nice but most of the sights are up on the surrounding hills. The Pena Palace is a ridiculously over the top royal palace and I was sad I did not get the chance to see it. Instead I spent a lot o time just climbing the hills and running around the Castelo dos Mouros. The castle is in ruins but still the walls seem to just merge with the rocky hill. And once in one of the bastions you are afforded a magnificent view over the surrounding Sintra National Park all the way to the Atlantic or back into Lisbon in the other direction. Truly a magnificent place and I am hoping to go back just to see the Palace. from quite a distance. The base of these chimneys turn out to be the kitchens. It's so cool to be inside them and look up to see the holes to the sky. We left Sintra and toured the circular tour stopping at the Monserrat Palace I believe it was, which was closed for repairs. We followed stone walls, saw old villas, in a romantic green forest. We wouldn't have been surprised to see a Knight Templar step out of the trees. the folks have trained vines to grow up around their homes. Lovely. Food was wonderful wherever we traveled and I developed a taste for bacalhau, the famed salted cod fixed a zillion different ways. All in all, a fabulous trip to a wonderful country. 376 Community Members have visited.